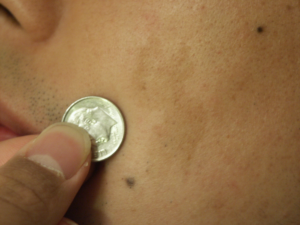 Cafe au lait macules are pale brown or milk coffee-colored birthmarks. They can occur at any site on the body, are usually less than ½ inch in diameter, and are not dangerous or harmful. Café au lait macules are usually present at birth but may occur later in childhood or increase in number with age. Treatment is generally not required, however, if there are multiple larger lesions, the child should be seen by a dermatologist to look for evidence of neurofibromatosis (a genetic condition that carries a high risk of developing a tumor). Treatment with lasers can lighten Café au lait macules and improve their cosmetic appearance.